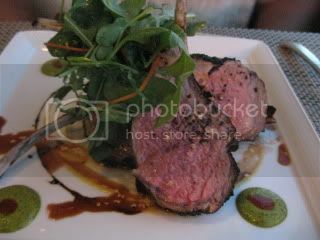 We were back at WP24 at Ritz-Carlton LA again. We got there early enough to enjoy watching the sunset from our table. Sweet Prawn Wontons, Chive, Thai Basil, Fried Ginger. 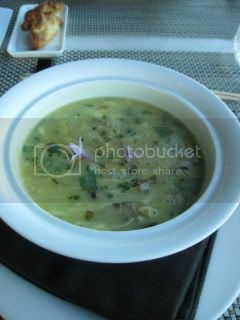 The soup was obviously prepared to order and the flavor was quite complex. There chunks of sweet crab meat and corn in the soup. 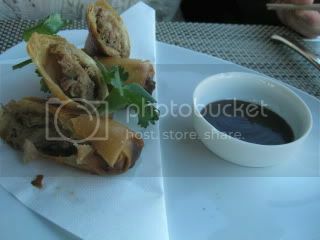 Jason's Peking Duck Rolls were nice, too. Roasted Black Sesame Vinaigrette, Chili-Orange Noodle Salad for the main course. 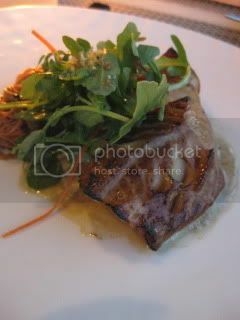 The fish was so rich in flavor. Beautiful. Jason's lamb chops (marinated in gochu jang sauce) was so huge and meaty! He loved it so much. 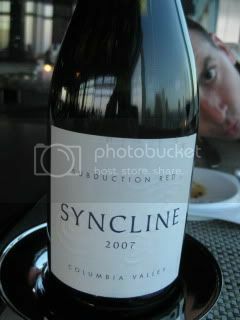 2007 Syncline, Subduction Red (Columbia Valley) was a perfect pairing for his lamb. It was a nice Rhone blend of 35% Syrah, 21% Mouvedre, 16% Grenache, 15% Cinsault, and 13% Couinoise. The wine was very juicy with hint of spice. Desserts were really special also. The menu has changed from the last time. 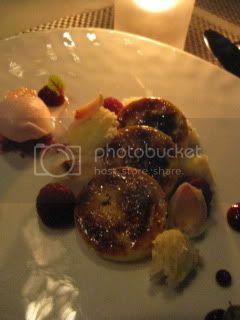 Raspberry Royale - Rosewater creme brulee, buttermilk honey sponge, lychee tea sorbet - was exellent. 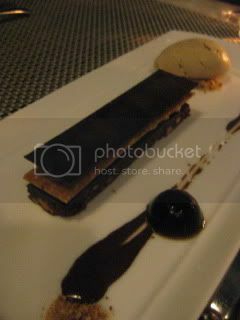 I also liked Marjolasian - Layers of dark chocolate, white espresso mousse, cashew nougatine, coffee ice cream. After such a big meal, we went to Aburiya Toranoko for more drinks and even yakitori! Yes, we are crazy. My stomach always has room for Toranoko's yakitori.